Super easy, super fast and super tasty. These appetizers will be the hit of the party and they are made with just five ingredients. 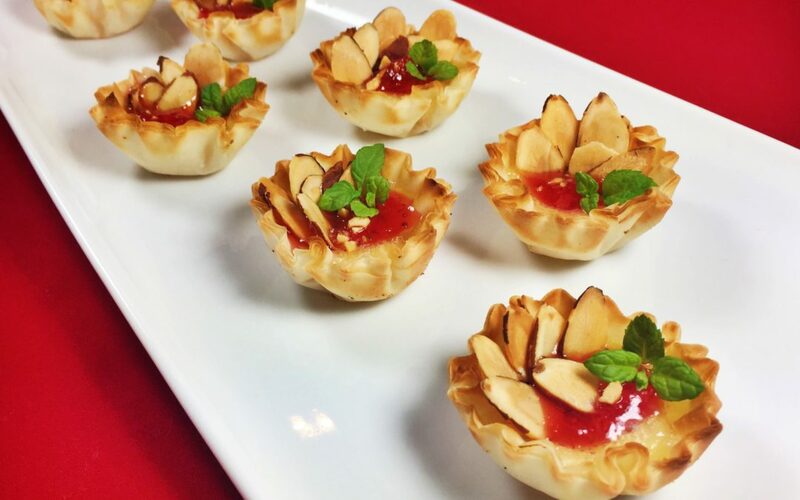 Using store bought Filo dough shells, tasty Brie, toasted almonds, fruit preserves, and baby mint leaves, you can bake up this dish in less than 15 minutes. So take the pressure off and remove some stress from the Holidays, while enjoying this delicious combination of savory and sweet. For the best flavor match with Brie – choose one of these tasty jam preserves, marmalade or fruit butter: strawberry, cherry, apricot, fig, orange marmalade or apple butter. Or be creative and use a combination. Preheat the oven to 350 degrees. Place the almonds on a sheet tray and toast for 6 minutes until light brown; remove and cool. Move the oven temperature up to 375 degrees and preheat. Place one cube of brie into each Filo shell. Bake the shells for 5 minutes or until the brie has melted into the bottom of the shell. Spoon ½ teaspoon of preserves over the melted brie. Place back in the oven and bake 2-4 minutes more minutes or until the preserves have slightly melted. Remove from oven and immediately garnish each shell with toasted almonds. Cool slightly and add the baby mint leaves (if using). Serve warm or at room temperature. Makes 30 Appetizers.